HAPPY NEW YEAR! TUESDAYS WITH LAZERBEAK WILL RETURN ON JANUARY 9th. Man oh man. I hope you’re all having a wonderful and relaxing holiday break from the action this week. This is one of my favorite times of the year and I love reflecting back on the past 12 months before January hits and we start this whole thing over again. On that note let’s jump right into the Doomtree Year In Review. It was an absolutely bonkers 2017 for us here at Doomtree HQ. Thanks a ton to all of you for rocking with us and supporting all of the Doomtree artists and releases. This year felt particularly productive and I’m way proud of all the music that got put out into the world. We burst into 2017 with this phenomenal video for “What They Don’t Know” off of Sims’ More Than Ever album. One of my all-time favorite Doomtree videos, this one is guaranteed to put a smile on your face. Endless amounts of local cameos too. Grab More Than Ever right HERE. Our first major release of 2017 was P.O.S’ Chill, dummy. Meaningful in many ways, especially because this was the first P.O.S album released by Doomtree Records since his Ipecac Neat debut. This album definitely set the tone for the year. Grab it right HERE, or pick it up physically in the UK HERE, and get the instrumentals HERE. I got to collaborate with Minneapolis electronic duo HOLIDAE and remixed their excellent “Scared” single. Shouts to our longtime friend and collaborator Ashley Gold on all the success she’s seeing with this group. Sims teamed back up with the homies Air Credits (ShowYouSuck + The Hood Internet) and hopped on their Omega Virus EP. Check out “Hack The Planet” below at the 5:15 mark, and watch their “GEAR SHIFTN” video below. We dropped the James Gundersen-directed video for “Faded,” a serious standout from Chill, dummy. I got to remix a track from one of my favorite local albums of 2016, BAIN’s Love In Blue. Check out the “Plateau” remix below. I had a blast with this one. Dessa pulled off a sold-out two-night stand with the Minnesota Orchestra and debuted some new music in the process. Watch this MN Original mini documentary to check it all out. Paper Tiger completed his year-long ongoing four-part EP series and we collected all the songs together to form the In Other Words LP as our second full-length release of 2017. I absolutely love this album and it was such a cool experience to release a record in chunks as it was being created. Grab it right HERE. I collaborated with my good friend and neighbor Bionik to create this Pool Boys EP. Five collabo instrumentals spanning all sorts of genres and zones, plus a massive sound pack with 300+royalty-free samples to go with it for all the beat makers, DJs, and producers out there. Grab that right HERE. Sims commemorated the six month anniversary of More Than Ever with this unreleased single called “Time Don’t Fear Me Back” which began to take shape during the More Than Ever sessions. Sims on the raps, Beak on the beat. And James Gundersen jumped in once again to create some awesome vizualz for us, this time for Sims’ “Badlands” from More Than Ever. Shouts to our guy Ryan “Kron” Thompson and all the creatives at Meow Wolf for putting together this vizual for P.O.S’ “Thieves/Kings” from Chill, dummy. Sims kicked the summer into high gear with another brand new one-off single. “No Getaway” was produced by the Guru Doug and features the homie Travla on guest raps. Our very own Cecil Otter released a brand new track in conjunction with the upcoming independent film Chasing The Blues. Cecil’s reimagined the centerpiece song from the film and flipped “O Death Where Is Thy Sting?” into a whole new realm with brand new production and vocals. Listen to both tracks below. July saw the announce and formation of SHREDDERS, a new group consisting of P.O.S and Sims on the raps, Paper Tiger and Lazerbeak on the beats (SICK TRIM 4 LYFE). We kicked things off with a surprise three-song self-titled EP and never looked back. Mike Mictlan pops up on opening track “Ions” from this as well. Check the whole thing out below and grab it from the following links. I remixed the Transit22 & P.O.S track “Throw The Match.” Really happy with how this one came out. LAVA BANGER. I collaborated with Har Mar Superstar and producer BJ Burton to create the latest Har Mar Personal Boy EP. Check out the epic seven-minute long title track below and grab the three-song EP right HERE. This was by far one of the funnest songs I’ve ever had the pleasure of working on. Excited to continue working with these two on new jams in the future. Shredders had our “XANTHRAX” single debuted by DWAYNE “THE ROCK” JOHNSON on his HBO hit series Ballers. You seriously can’t make this stuff up. So tight. And speaking of Shredders (SEGUE! ), we threw a fake kids birthday party in my backyard while director Mercies May filmed the chaos. Check out the “Cult 45” video below, complete with a killer Penny cameo. We announced the debut Shredders album Dangerous Jumps, the third Doomtree Records full-length of 2017, with lead single “Flipping Cars.” This was the first song that we ever made together for the project and pretty much set everything in motion. It was only right to lead with it. I had the equally cool and bizarre experience of being shadowed by KFAI for a feature on the day in the life of an independent record label CEO. Huge shouts to KFAI, MinneCulture, and Nancy Rosenbaum for shedding some light on my mundane but quite necessary role at the windowless Doomtree office. Check out the feature and interview below. Adam Dunn created, directed, and VFX’d the hell out of this awesome “Roddy Piper” video from Stef’s Chill, dummy album. One of my fav videos of the year. Mike Mictlan popped up with some guest vocals on a track from our good friend Greg Grease’s latest project. Check out “The Motion II” below which features fire bars from Mike, Greg, I.B.E., and Ak-Rite over a heat knocker produced by Greg himself. We dropped the Isaac Gale-directed vizual for “Flipping Cars” from Dangerous Jumps. Such a total blast making this one. And then followed it right up with the Adam DeGross-directed video for “Xanthrax.” Shouts to Robert Henry for the glitched-out treatment. Dessa jumped back on the scene with a brand new one-off single called “Good Grief.” Lyrics and vocals by Dessa with production by Paper Tiger, Lazerbeak, and Andy Thompson. Check out the lyric video below courtesy of Adam Dunn. Transit22 and P.O.S made and released a music vid for the “Throw The Match” remix. November saw the release of Dangerous Jumps, the debut album from SHREDDERS (P.O.S x Sims x Lazerbeak x Paper Tiger). This is by far one of the my most favorite albums that I’ve ever been a part of. I could not be more proud of how this thing came together. Watch the crazy YouTube album stream below and grab it from any and all of these digital links. We’re headed on our very first Shredders tour to kick off 2018. Make sure to check out the dates below and grab tickets right HERE if we’re coming near your town. Our good friend and longtime collaborator Joey Van Phillips created and released his first ever solo album. Joey has drummed on tons of Doomtree crew songs and solo songs as well, and was the touring drummer in Dessa’s live band for years. So cool to see him create an entire project with the help of a million extremely talented friends. Our very own Cecil Otter, Sims, Dessa, and P.O.S all show up throughout the album. Check out those songs below. Sims commemorated the one-year anniversary of More Than Ever by liberating this incredible Air Credits remix of “OneHundred.” So cool. These guys have been collaborating a ton as of late and I can’t wait for you to hear some of the new heat they’ve got in store for 2018. MSP Magazine made a little mini-doc on Dessa for their My North video series. This features some footage from the Doomtree full-crew at The Palace this past November. P.O.S, Sims, Paper Tiger, and myself created the Shredders “Does It Shred?” weekly mini podcast with the help and visual effects of Adam Dunn, where we basically just debate the shredding merits of any and every thing we can think of on the spot. Check out the first five minute-long episodes below. We’ll be back next year with a ton more of these. Click into the actual YouTube videos in order to navigate the room in full 360 VR glory. We kicked December off with a crazy music video for the Shredders track “Entertainment.” This song is definitely a highlight from Dangerous Jumps for me, and James Gundersen absolutely slaughtered it on the directing/editing/VFX trifecta. 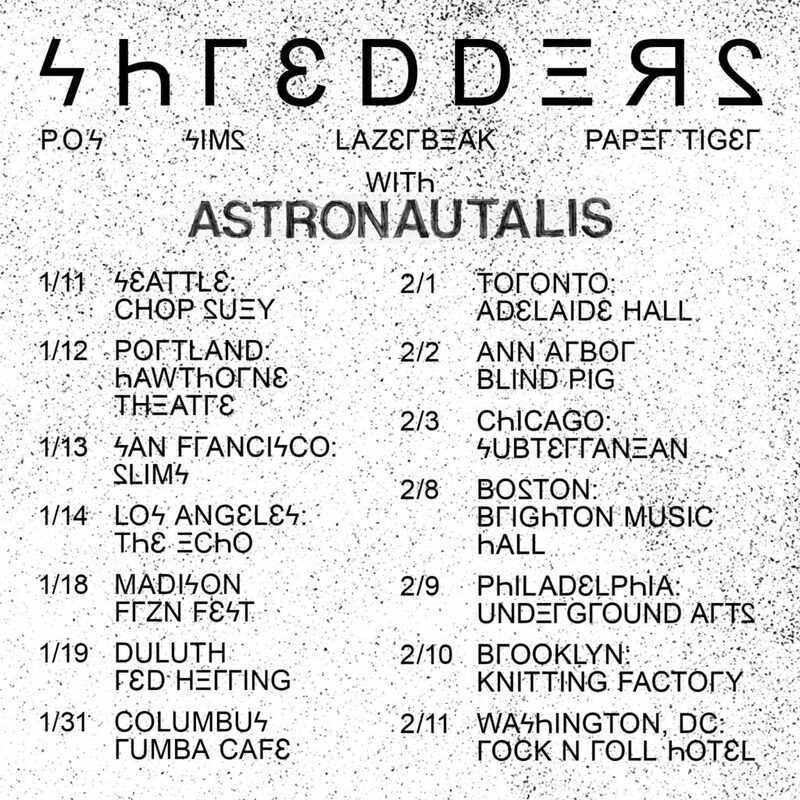 Just to reiterate: SHREDDERS is going on our first-ever tour! P.O.S, Sims, Paper Tiger, Lazerbeak. Coming to a town near you much sooner than later. Check out the full list of dates in the video below and grab those tickets HERE. 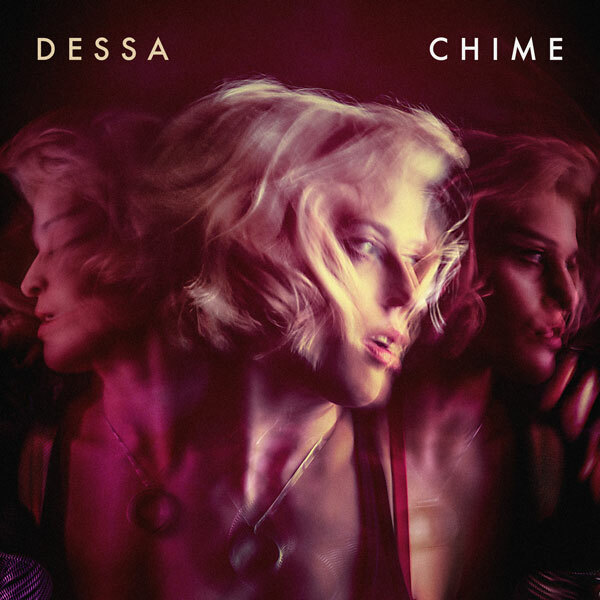 We closed out 2017 with the epic announce of Dessa’s new upcoming full-length album Chime, due out on Doomtree Records this coming February 23rd. SO PUMPED! To celebrate the announce we released a brand new single from the project called “Fire Drills.” Dessa on the lyrics and vocals, composer Andy Thompson on the music, and Beak on the additional production. Check it out and pre-order the album from all the links below. 2018 is gonna be insane. I collaborated with my good old friend Medium Zach for his weekly #BeatStory series. We kicked it at Woodgrain and played on all sorts of instruments before chopping everything up and creating a beat from scratch. Check out the full video below. Such a fun way to end the year. And lastly, Sims hit up the Go 95 studios to drop a crushing 78 bar freestyle on the Mr. Peter Parker Show. BARS BARS BARS BARS BARS. Such fire. BOOOOOOOOOOOM! 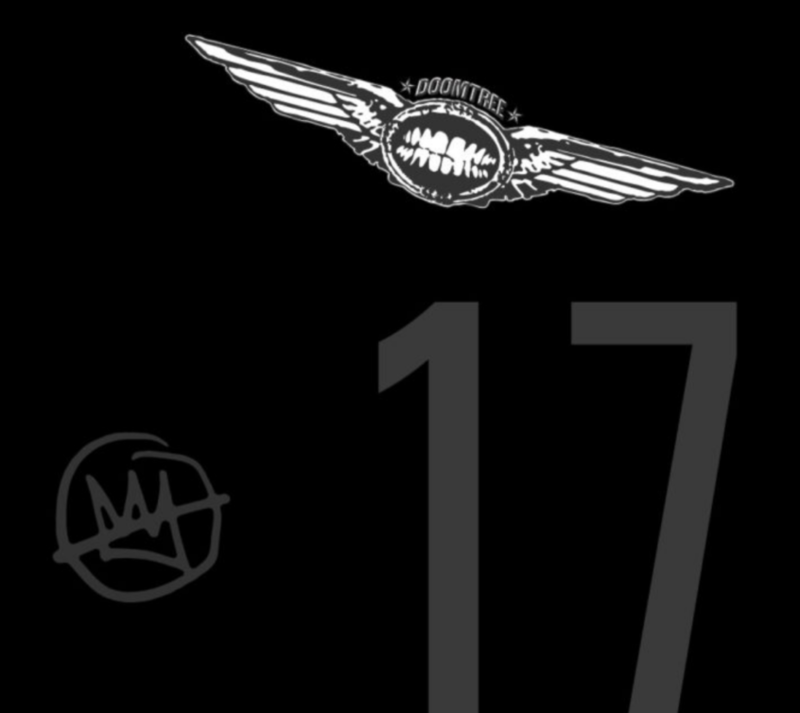 That does it for the Doomtree 2017 Year In Review. It was truly a whirlwind of new music and releases and I’m very thankful for my crew and every one of you for your support. Shouts to Mary Thayer for putting together this Spotify playlist that collects all of these highlights in one place in case you want to bump them on the go. I hope you all have a truly awesome end of the year. See you in 2018!